Tuesday – Friday 10 a.m. – 5 p.m. Saturday – Sunday noon – 5 p.m. 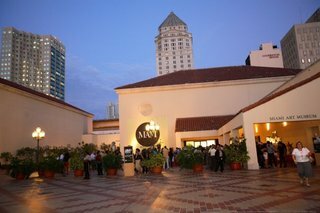 The Miami Art Museum of Dade County (MAM) advances public knowledge and appreciation of art, architecture and design, and enhances the cultural experience of the residents and visitors to South Florida. MAM promotes artistic expression and the exchange of ideas reflecting the diversity of its community and its pivotal geographic location at the crossroads of the Americas. The mission of MAM is to exhibit, collect, preserve and interpret international art with a focus on the art of the 20th and 21st centuries. To complement its mission and to provide a broader historical context, MAM presents works of art outside of this time frame when appropriate. MAM is dedicated to education and scholarship. To this end, MAM takes a variety of approaches, including publications and other materials, to interpret its collection and exhibitions for its many audiences. MAM engages the community in lively exchange, fosters fresh ideas, and conveys the excitement of the creative process. The Museum is a catalyst for the visual arts nationally and internationally.